Dental implants are the modern choice for tooth replacement. They look and feel natural, and can be used to replace one or several missing teeth, or even to secure a denture. Turlock-based dentist Dr. Eggleston has extensive experience in implant dentistry and can help you decide if dental implants are the right tooth replacement option for you. This is a technique where teeth are removed, Implants are placed, and a new smile is delivered all in the same day. It’s a terrific solution for replacing bad or missing teeth and for restoring a smile. The teeth are secured into the implants and can be used that same day. They are very secure and comfortable. They look great, feel great, and they work great. A dental implant is a titanium post that is placed in the jaw bone to replace the root of a missing tooth. Once the titanium post has become integrated with the bone, a crown (replacement tooth) is then made to fit on the top of the post. Dental implants are considered the standard for tooth replacement whether the goal is to replace a single tooth or multiple teeth. Dental implants are strong, durable, and beautiful. Care for dental implants requires regular dental cleaning, brushing, and flossing, just as you would do for your natural teeth. The placement of dental implants at our Turlock practice is a very simple, comfortable procedure that offers numerous health benefits. Whether you are missing a single tooth or multiple teeth or need to secure a denture, implant dentistry is the healthiest alternative available. When a tooth is missing, we begin to lose bone structure in that area. Over time the bone loss can affect the adjacent teeth and cause them to shift and weaken the support system. Once the process of bone loss is in effect, the only way to stop it is to replace the natural tooth with an artificial structure such as a dental implant. The dental implant acts as a stimulant to the bone, enabling the bone level to remain healthy. For patients with full dentures, the bone loss can be extensive, eventually causing the facial structure to sink in, affecting the biting function and strength of the jaw, and creating unnecessary wrinkles. This can affect a persons’ confidence and self-esteem. In many cases the placement of full dentures can reduce a person’s lifespan by ten years due to systemic health, digestive, nutritional, and psychological conditions. Dental implants can help stop this loss of bone. In the past, options for replacing a single tooth have been limited to either a bridge or a partial denture. Neither of these options provides the strength or the health benefits of a dental implant. While bridges require the unnecessary grinding down of the two adjacent teeth and partials cause undue stress on the teeth holding them in place, dental implants replace the missing tooth, restoring bite function and stopping bone loss in the extraction site. Whether you are missing multiple teeth all in one area or in different areas of your mouth, dental implants are the healthiest replacement option available. Single dental implants or implant bridges are two options that offer strength and stability, stop bone loss, and don’t harm the health and structure of adjacent teeth. If you have dentures, you may have experienced some embarrassing moments. Do your dentures slip, fall out, or make chewing and talking difficult? Unfortunately, missing teeth cause the loss of bone, which would normally help support dentures, and after a while lead to loose-fitting dentures. Facial features also begin to sink in, more wrinkles appear, and chewing ability decreases, making it difficult to eat a balanced diet. This can take a toll on physical and emotional health. With dental implants, our team in Turlock can secure your denture so that it stays in one place, restores facial structure, and minimizes wrinkles. Not only does an implant-based denture keep you out of embarrassing situations in public or intimate moments, it also restores self-esteem and confidence. Implant-based dentures also allow our patients to eat a well-rounded diet, keep medications to a minimum, enjoy improved health, and ultimately increase their lifespans. Your denture can be secured with single implant posts and attachments or an implant bar. Doing so keeps your denture in place. Apples, corn on the cob, ribs…you bet! If you have been dealing with loose, slipping, or uncomfortable dentures and you just don’t want to deal with a denture at all, whether conventional or implant-based, dental implants can offer you the freedom of fixed, non-removable teeth. With a combination of single implants and implant bridges, you can have a natural, functional, and fixed smile. Fixed implants offer incredible strength and excellent biting function, and they look absolutely beautiful and natural. They even eliminate the hassle of removing a denture. In many cases, when teeth have been missing for a while the jaw structure is compromised due to bone loss and cannot support a dental implant. Bone grafting can replace and enhance bone structure to ensure that the patient has a proper base for supporting a successful implant. We perform all bone grafting procedures right here in the comfort of our office. A: There is minimal discomfort throughout the implant process. Most patients claim that the extraction of the tooth was more uncomfortable than the whole implant process. A: Dental implants can double the average lifespan of a bridge and they do less damage to adjacent teeth than a bridge or partial denture. 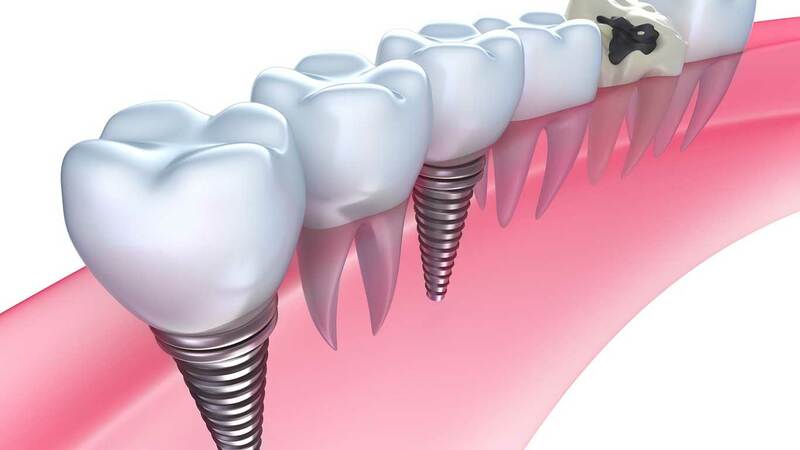 In most cases, the lifespan of an implant can be more than 20 years. Sure, the crown portion may eventually need replacement, but the implant post, if taken care of, can last a lifetime and is considered the most reliable dental solution available. Q: How long does it take to place and restore a dental implant? A: While the placement of a single implant can be completed from start to finish in 5 to 7 months, more complex cases can take 12 to 24 months for healing and integration, especially if there are bone grafts involved. All in all, though, it is well worth the wait! Q: Why do you have to do bone grafts? A: Bone mass is vital for allowing dental implants to securely integrate into the jaw bone, so if there are areas that lack the necessary bone height or width, a graft is necessary. We perform bone grafts from simple socket grafts to more involved autogenous and sinus grafts. Best of all, we perform them all here in the comfort of our office. Your grafting procedure is performed by our experienced staff, and post-operative care is carefully reviewed.